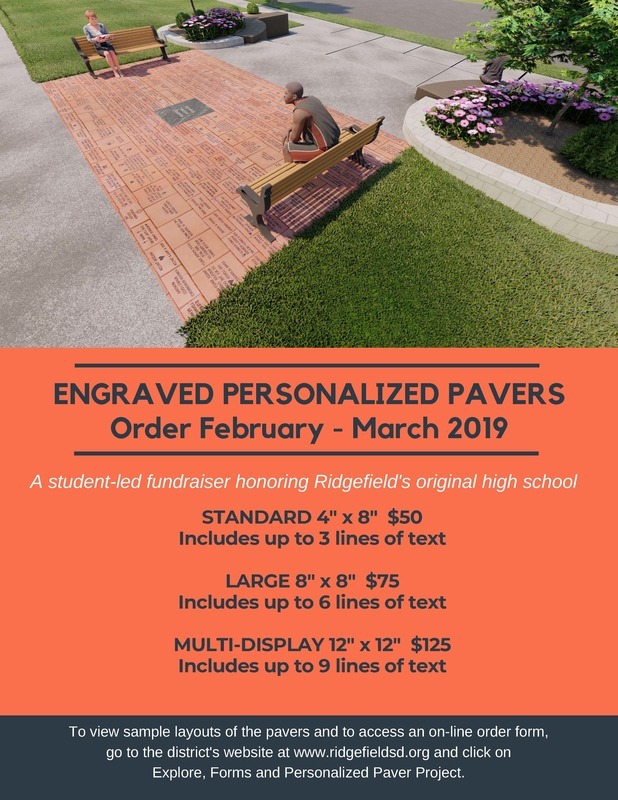 Orders are now being taken for purchase of personalized engraved brick pavers that will commemorate the site of the original Ridgefield High School. The pavers will be installed in the space at the top of the historic steps at the newly-renovated Ridgefield Administrative & Civic Center (RACC) on Pioneer Street. The fundraiser is part of an ongoing project led by students in the Superintendent’s Student Advisory Council (SSAC) to create new landscaping around the new facility for the benefit of the Ridgefield community. Three different sizes of pavers are available: Standard 4”x 8”, Large 8” x 8” and Multi-Display 12” x 12”. Click here for information regarding paver layout information and pricing and click here for an online order form. Download the order form and complete it online. Save the completed form to your computer. Email the form to communications@ridgefieldsd.org. Pay online with a credit card at https://ridge.revtrak.net (click on Events). Print the form and send with payment (cash, check or money order) to the Ridgefield Administrative & Civic Center at the following address. Please make checks and money orders payable to Ridgefield School District. If mailing, please do not send cash. Blank order forms are available at the RACC front desk for your convenience. Paver information and the order form can be found on the district website at www.ridgefieldsd.org. Click on Explore – Forms – Personalized Paver Project. Orders will be accepted through March 31st, and paver installations will take place in early summer. Please join us in helping to commemorate the history of Ridgefield’s original high school. Thank you for your support!